I think this picture speaks for itself. 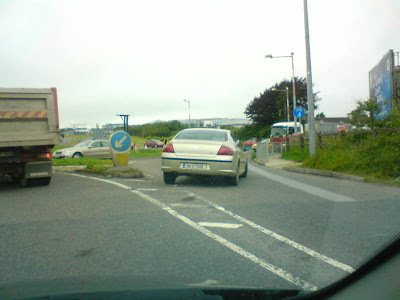 I was behind the motorist in question, stuck behind a queue of traffic blocked because of roadworks on the road to Kinsale. Needless to say the idiot in question DID go on to exit the roundabout on the wrong side of the road via the entrance, having driven around the bollards to avoid getting stuck. He/she also had to force her way out onto the blocked roundabout due to coming out via the entrance rather than the exit, which left the other road users none too happy. Sadly, I was too far back to get a photo of this. I think people like this should be public named and shamed. And its incredible we are so desperate to take those who haven't had a chance to even sit a driving test off the road next week when there are dangerous drivers like this on the road with scant regard for other users, clearly in the belief that the rules do not apply to "moi"!